Happy Father’s Day little fish! Featured » Happy Father’s Day little fish! One of the best dads in the animal world, is also the smallest. The threespine stickleback is a little native fish common to Beaver Lake. This devoted dad – all 5 cm of him – lives for his offspring. Once the female lays her eggs in a nest he alone built , he chases her off and takes over rearing responsibilities. He fans the eggs for up to 8 days with his fins to ensure adequate oxygenation, and chases away any other males that come near the nest. Once the eggs hatch, the male attempts to keep the young together for several days, sucking up any wanderers into his mouth and spitting them back into the safety of the nest. 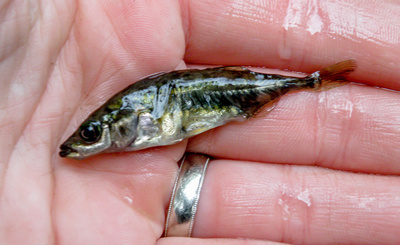 This stickleback was caught (and released) in Beaver Lake during a SPES amphibian survey. A variety of wildlife surveys help us monitor animal populations in the park which contribute important data to park management plans and projects.